Newton's Nook Designs: Newton's Holiday Mischief by Danielle Pandeline! Ready for some Holiday Mischief? Today I get to inspire you with this lovely card by Guest Designer Danielle Pandeline! Danielle has created this adorable card using Newton's Holiday Mischief - one of our newest holiday stamp sets, Newton's Holiday Mischief, featuring our cute little Newton all tangled up in lights! 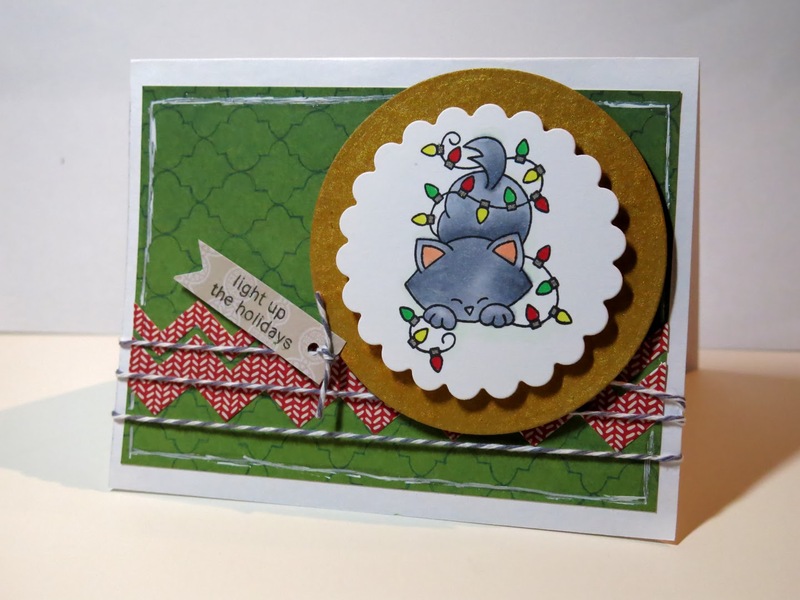 I love how she colored this cute little feline and added him onto this card with some chevrons and twine! Sooo Cute! Thanks, Danielle for being our guest this month! Do you love this card? Make sure to go say hello to Danielle and tell her so on her blog, Girl Racer Scrap! That's a very cute fun card there Danielle. What an adorable card, Danielle! Your Newton is so sweet! Fabulous inspiration!